Kodak goes old school, much to the delight of non-digital photographers and filmmakers the world over. Kodak has finally put its Kodak Ektachrome film on sale, breathing some much-needed life into film once. Kodak announced back in 2015 that is was resurrecting the format but it has take three long years for it to make a product that is actually available to buy. Kodak's Ektachrome plans are two-fold: first, there is the Kodak Ektachrome Film E100 in 135/36x camera format and then, for Super 8 movie makers, there is the Ektachrome 7294. 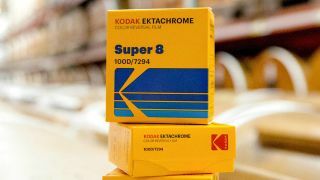 Camera users can rejoice as the Kodak Ektachrome Film E100 range is available right now while the Super 8 format will be available from October. There will also be a 16mm version of the film available at a later date. According to Kodak, the film "features clean, vibrant colors, a neutral tone scale, and extremely fine grain. "The distinctive look is well suited to a wide range of applications, such as product, landscape, nature and fashion photography." It's good to see Kodak focus on what it is good at, given it has recently steered into the strange world of cryptocurrency with KodakCoin.